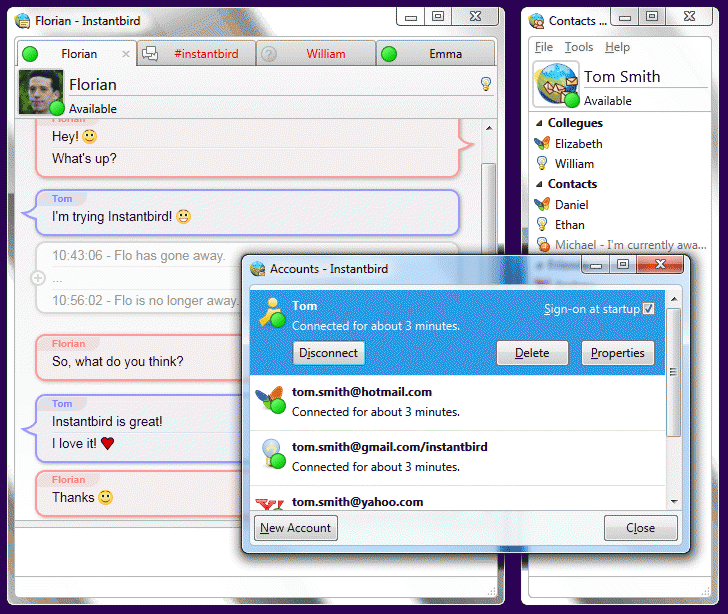 Instantbird is a simple and easy to use instant messaging client with support all the major networks. The program has a tabbed interface and similar look and feel to Firefox/Thunderbird (uses the Mozilla codebase), and includes support for customization using themes and add-ons. Available networks include AOL, Yahoo, MSN, Google Talk, Twitter, Facebook, XMPP, IRC, ICQ, and more. Instantbird Portable is a version in PortableApps.com format. How to extract: Download the self-extracting EXE and extract to a folder of your choice. Launch InstantbirdPortable.exe. - Clicking the '+' button in a conversation window shows a list of conversations that can be started with a single click. - The list is sorted with a frecency algorithm, taking into account how often and how recently you've talked to each contact. - This list also automatically includes the channels advertised by the IRC servers you are connected to. New tooltips that better fit the style of Instantbird. - Participants now have context menus that allow you to open private conversations or add them as buddies. - Highlighted nicks in chat rooms now have tooltips and context menus. And more... read the full ChangeLog for details of all code changes since Instantbird 1.4. Update fixed reconnection problems. Very happy with this. Love the simplicity, ease of use, familiar look and feel, but the program doesn't reconnect when there's a connection problem (I have a bad one) so I'm constantly restarting the program.